Yom Kippur begins tonight with Kol Nidrei and ends tomorrow night with the singing of Avinu Malkeinu (Our Father, Our King.) 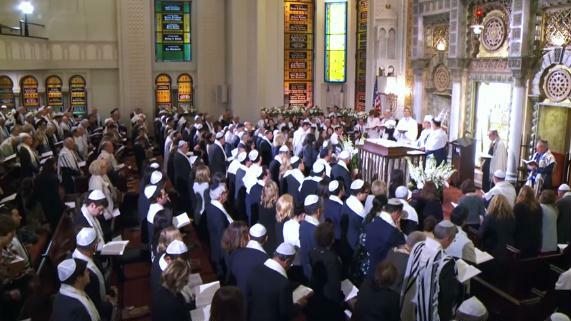 The prayer is chanted at the end of the Neilah service before the last shofar blast of the High Holidays. There are many versions of Avinu Malkeinu, but one of the most popular is the one composed by Max Janowski. Today we're sharing that version as sung a year ago in New York's Park Avenue Synagogue by cantors Azi Schwartz, Shira Lessek, and Rachel Brook. The words appear below the video. We hope it puts you in the proper mood to experience a meaningful day of prayer and reflection. We'll be in synagogue all day tomorrow and back on Thursday with our usual Jewish Humor Central mix.